and Ray Liotta in a publicity still for Cop Land. In recent years, the crime thriller genre has become increasingly simple-minded, stocked with movies that pile on effects with little regard for things like pacing and character. So it's a big surprise when a quiet movie comes along, especially when its television trailers make it look like another mindless pyrotechnics display. Cop Land is a revelation. 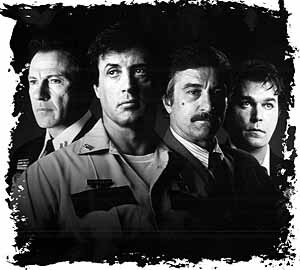 It may have a big powerhouse cast--Sylvester Stallone, Robert De Niro, Harvey Keitel, and Ray Liotta--but it feels like a smaller movie. Director James Mangold takes his time developing the story, and in the process, we get to know and care about the main characters, particularly the small town local sheriff played by Stallone. At the same time, however, Mangold builds a palpable sense of tension, as if rain clouds of misery are constantly ready to rip loose with a torrential downpour. Unlike other crime thrillers that hit their audiences with a non-stop barrage of explosions and shrapnel, Cop Land contains relatively little gunfire. Mangold builds suspense gradually until the movie does finally erupt in violence. As a result, when guns are finally pulled, the impact is much greater than in those movies where the guns are pulled oh-so easily. With just one previous feature film to his credit (the Sundance Film Festival favorite Heavy), it's a wonder that Mangold was allowed to make this movie. It doesn't contain any of the big action set pieces that make up most thrillers nowadays. But just one look at the screenplay must have been sufficient for some of the finest actors in Hollywood. Sylvester Stallone eagerly sought and won the lead role--a character very unlike the action characters that he has built his career on after Rocky. He also gained a little extra flab for his role--about 40 pounds worth. Stallone plays Sheriff Freddy Heflin. Freddy always dreamed of joining the New York Police Department, but a teenage accident left him deaf in one ear. As a result, he always fails the hearing test for the NYPD. He resigns himself to never fulfillng his dream--"I don't mind," he says--and becomes the sheriff of a small, quiet town named Garrison in New Jersey--just across the bridge from New York City. While a crime is committed every eight seconds in New York, Garrison is virtually crime free. But Garrison is practically owned by the New York police force. Many of New York's finest call it home, a place that they can control, a place where they can build a better community. In the process, however, they create their own world that looks and feels like an offshoot of the Mafia. 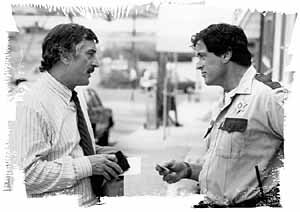 Robert De Niro plays an Internal Affairs investigator who turns to Sheriff Freddy Heflin for help in determining what is really going on in Garrison. Freddy knows the answers but he's afraid of turning against the men he respects. He sees the corruption, but he turns away, his shoulders hunched submissively. Harvey Keitel plays one of the NYC cops who live in Garrison. He's the guy to know, the guy who gets things done, the guy who'll do whatever it takes to maintain order in Garrison--even if that means murder. Ray Liotta plays a NYC cop disillusioned with the Garrison order after his partner dies. In addition, we get Annabella Sciorra as the only woman Freddy has ever loved, but she's married to a pretty boy NYC police officer (Peter Berg) who cheats on her constantly. 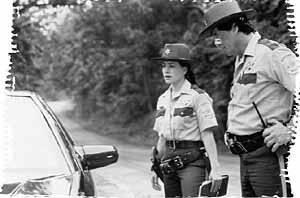 Janeane Garofalo plays Freddy's new deputy. Michael Rappaport plays an exurberant young cop nicknamed "Super Boy." In short, Cop Land has one of the best casts since Pulp Fiction. Regardless of its contemporary trappings, director Mangold has fashioned a movie that feels similar to some great old Westerns. Freddy prowls the streets of Garrison like Sheriff Will Kane in High Noon, with eyes downcast and a lazy slouch. Unlike Will Kane, however, Freddy Heflin isn't looking for any help. He suffers in silence, never considering his future as his life wastes away. But eventually, as he sees the corruption all around him, he must act. "I look at this town and I don't like what I see anymore," he says. Sylvester Stallone delivers a strong performance. He's not quite in the same category as De Niro, Keitel, and Liotta--but he delivers one of the best performances of his career. At times, I felt Stallone's performance was too mannered. He gives Freddy a whole set of mannerisms that sometimes feel like affectations instead of outgrowths of his character. But whatever the case, Stallone carries much of the burden of making this movie work and he pulls it off. It's his movie all the way, while De Niro, Keitel, and Liotta actually find themselves in supporting roles. Stallone gives the movie a sense of poignancy, the sense of a life sacrificed for his own unrequited desires. The future looks very bright for director/writer James Mangold. He never opts for the cheap crowd pleasing moments. He builds Cop Land slowly and deliberately; however, in the process, through the honesty in his approach, he creates a world that bristles with energy and life. Keep your eyes on Mangold. He's one of the most talented directors to emerge in the '90s.